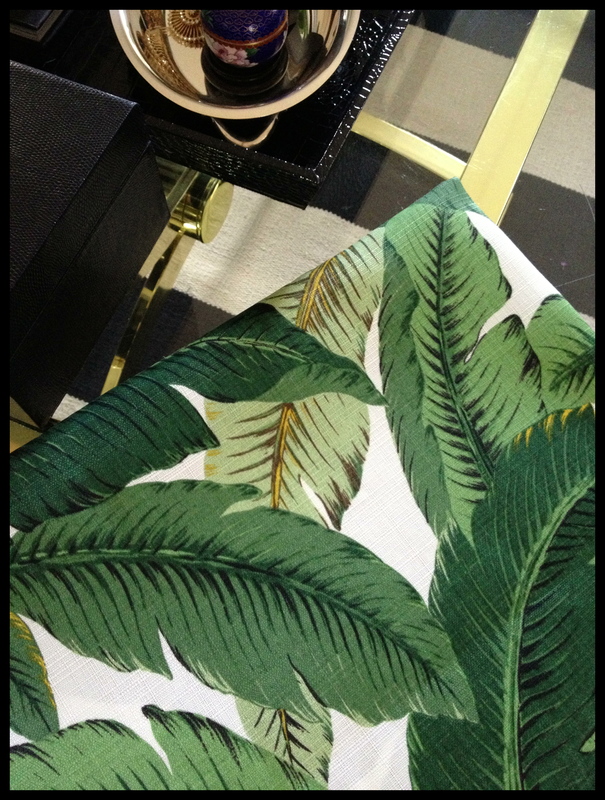 I’m absolutely loving Hinson’s classic Martinique Banana Leaf print. The print originated in 1942 as a wallpaper used in the iconic Beverly Hills Hotel. Now, it’s become somewhat of an icon in and of itself. We’ve seen it crop up in interiors over the last few years, used as a cool nod to a vintage era (much like the resurgence of aged brass and Campaign chests!). The trend is even showing up on the runway (loving these Charlotte Olympia sandals, by the way) as a fresh take on the color of the year. It’s definitely “vintage-chic”, and I’m hopelessly smitten! If I really admit it, I think part of my love has to do with a sense of nostalgia for the beloved print. 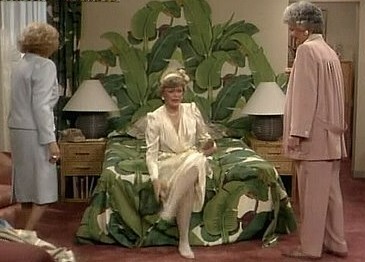 Not only did it originate in California, it brings back memories of warm Saturday nights, laying in front of the TV as a kid and watching The Golden Girls with my mom (Seriously, Mom, you let me watch that? Pretty racy for an 8 year old…). But as I mentioned before, this incarnation is much more of a chic throwback to the 1940’s original than 80’s Miami. 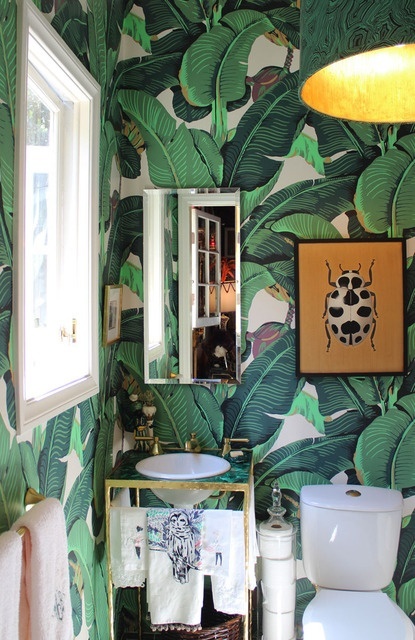 Try using the wallpaper in a bathroom (papering the ceiling, too!) for small space drama, or use it as an accent wall complemented by clean lines and modern finishes (like Nate Berkus and Brian Atwood’s place). And it still looks so chic paired with pink (yes, pink)! 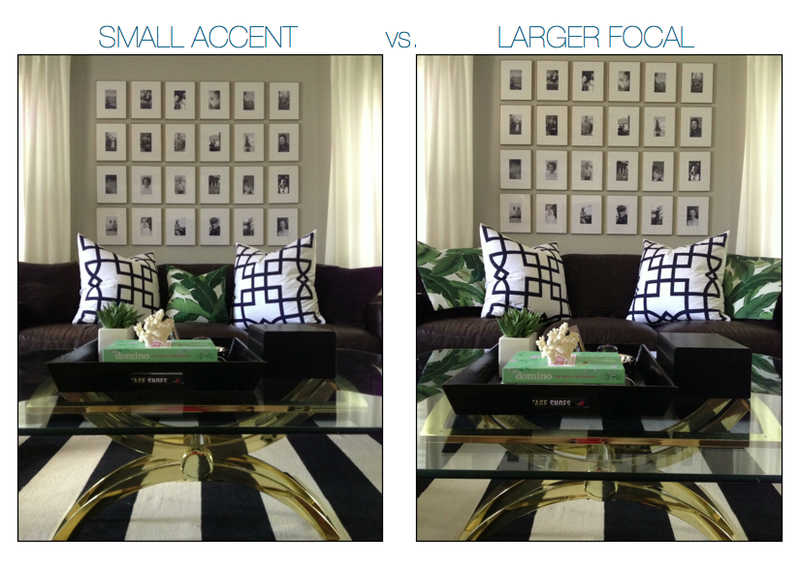 As for me… I can’t quite convince R to commit to wallpaper, so I’ve opted for a toned-down accent with throw pillows inspired by the Martinique print (purchased at my new favorite Etsy store, Whitlock & Co.) . I just can’t make up my mind on how I want to style them. Keep it as a subtle accent or a more dominant piece? I’m kind of digging the double pillow action. I love the idea of wallpaper, but wallpaper scares me. I’ve scraped too many country patterns off my mother’s walls over the years! I love this pattern it is so dramatic. Great images! Thanks, Mollye! I’m absolutely in love with them! Totally sang Hollaback Girl! Double pillows, looks great with the green accents on the coffee table!